Are you an excited Bride to Be. 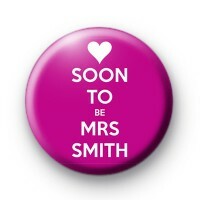 let everyone know what your name will be after the Wedding with this Pink Custom Soon To Be Mrs Badge. Let us know what Surname you would like us to print on the badge Maximum of 10 letters please using the box below the description.